It happens all the time with student narratives: The story starts out impressively — full of vivid detail, carefully portrayed characters, and a complex plot. Then, a page later, everything speeds up. The details get overlooked and the conflict suddenly gets resolved. Story’s over. The student starts out with high hopes for an engaging story. He begins painting rich and textured scenes, employing an eye for detail. The problem is, this kind of writing takes time and effort. More time and effort than he imagined. Before long, the writer gets tired and realizes that at this rate his story is going to be twenty pages or more. So, he starts taking shortcuts, skipping the fine points that made the first paragraphs so strong. Eventually, he scraps some plot points and gets right to the end. The problem here is one of pacing. Well-crafted stories move at a considered pace. This doesn’t mean that the pace doesn’t speed up or slow down when appropriate. It does mean, however, that the paper doesn’t crash to a stop when it nears the end. And it means that the attention to detail found in the introduction will remain consistent throughout. 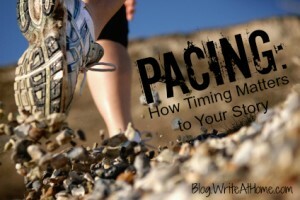 A good feel for pacing means that you keep the story moving and slow down when building anticipation or suspense. It means you include enough detail and description to create the right atmosphere and draw your reader into the story and its characters. One first draft I received recently was about a big relay race at a swim meet. The writer did a terrific job of building the scene. She spoke of previous successes and the importance of this final championship race. She built tension and anticipation of the moment. Then, suddenly, the race was over. Her team had won. She hadn’t described the starter’s gun, the plunge into the water, or the exhilaration of the actual event. What this student included was well done. It was what she left out or rushed through that weakened the paper. Her revision was worlds better because she lingered on the experience of the actual race. She helped me feel what it was like to participate in a swimming relay — the thrill of cheering on your teammates, the cold splash of the water, the ache of the arms, legs, and lungs. When she touched the final wall I was right there with her. Give careful thought to the pace of everything story you write. Are there places that you should move through quickly? Places where you should slow down? Are you consistent in the detail you provide? Do the most important parts get the most careful treatment? Don’t bite off more than you can chew. Keep your stories simple enough that you can maintain a steady pace throughout. Make a blogger’s day: Leave your comment below. I just wanted to say that I really enjoy your posts, and found all three in this issue very helpful, even though I feel fairly comfortable with my own writing, and have yet to try any hints for writing for aspiring English speakers. (I did link to your essay on abstract and concrete for my newsletter that included ‘abstract’ in the vocabulary list.) Your explanations are consistently clear and concise (i.e. you practice what you preach.) Thanks. Thanks for the kind words, Cathy.